This week I’m going to spotlight the Robin Mask figure – but only the blue suit version. The reason why this version of the Robin Mask figure is featured is for three reasons. First, the blue suit Robin Mask stands out over other Robin Mask figures (e.g., the silver version) because of his dark blue armor and light blue skin – which is supposedly a part of his suit. The second reason is that I only collect the blue Robin Mask. Yes. I have M.U.S.C.L.E. 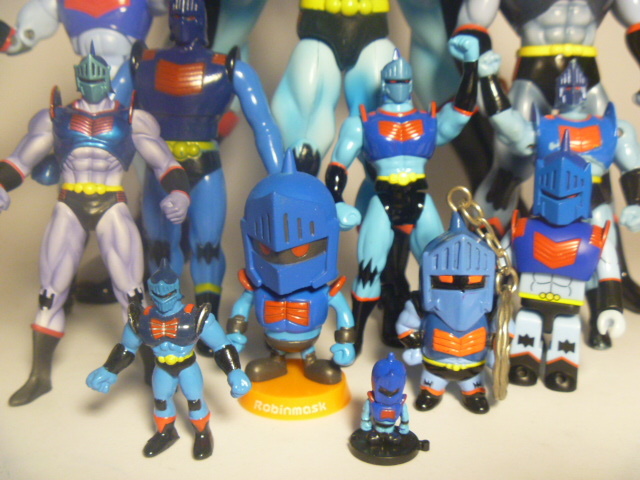 figures, Deka kinkeshi, Great kinkeshi, and the like. But if I see a Blue Robin Mask that I don’t have, I tend to want it! Finally, to me, what is so awesome about blue Robin Mask is that there is so much variety. Not only is he available from different lines of toys, but he’s available in many different sizes. 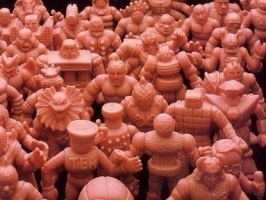 There is a painted M.U.S.C.L.E figure #46 in the very front. 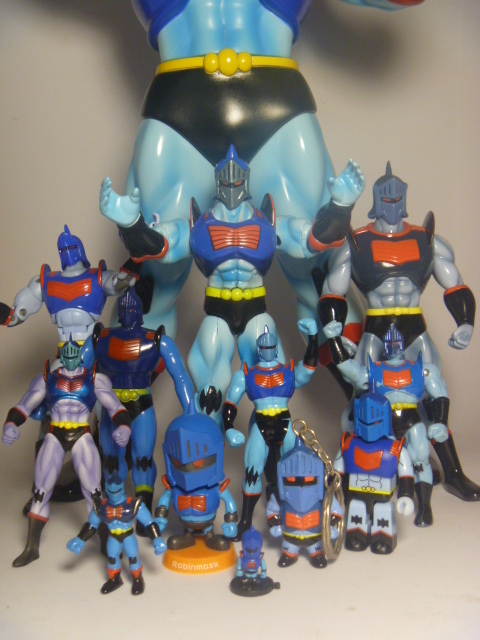 It gives you a scale as to how many different sizes there are with blue Robin Mask. 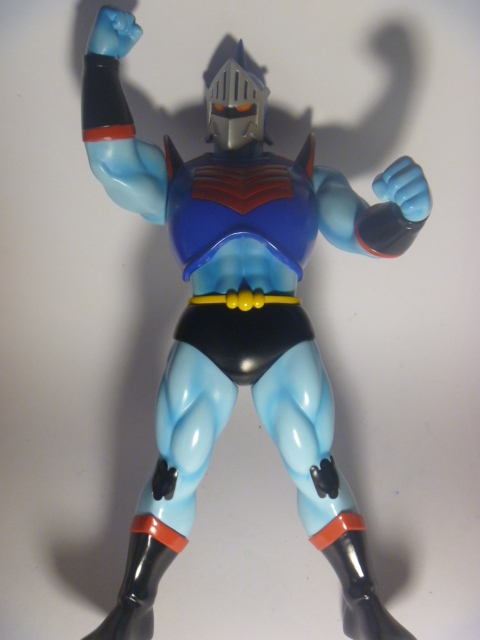 On the other end of the scale you have the huge 18 inch Giant Kinnikuman figure – even though we predominantly collect little rubber toys, I do love the really large figures! The Giant kinkeshi can move his head and arms too. Because Robin Mask is a central character in the Kinnikuman line, a blue one is available in practically every line of figures. 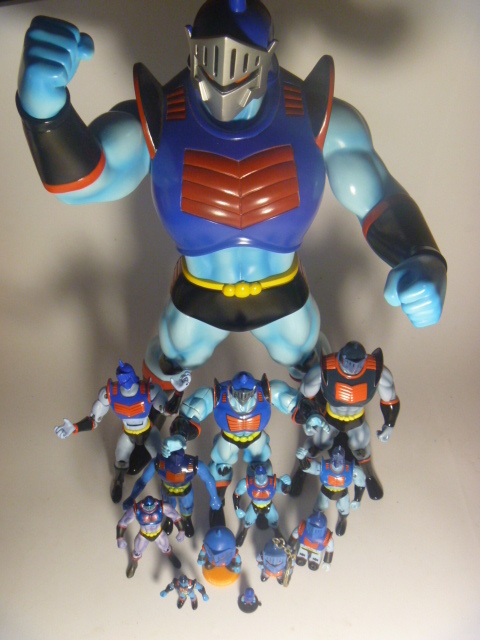 Here you can see the Romando, Banpresto, Chojin Power Series, 80’s Bandai, Kubrick, and classic M.U.S.C.L.E. figures. There is a 5 Star Blue Robin Mask I’m looking for which will fit the size gap between Romando at seven inches and Giant at 18 inches. Which other ones are missing? That is the challenge ahead here and I’m looking forward to it. Hunting is 75% of the fun! This entry was posted on Monday, September 23rd, 2013 and is filed under UofM News. You can follow any responses to this entry through RSS 2.0. You can skip to the end and leave a response. Pinging is currently not allowed. The big one is awesome!